Throughout its production run the Trimphone had a large number of different models and variations. All GPO phones had model numbers normally stamped on the base of the phone, and as long as the numbers are still readable you can work out which model it is. The early Trimphones were supplied with lettered dials and these were shown on the Post Office's first publicity leaflet for the Trimphone. These are very rare. All Trimphone dials had a transparent fingerplate over the numbers. Those on the 712 are subtly different and cannot be interchanged with the later 722 models. The letters L and F after the model number indicate a lettered (L) or figured (F) dial. So Telephone 1/722L is a lettered dial version of the 1/722. The vast majority of phones for sale on eBay are of the 2/722 type with a figure dial. Also look out for a special version of the Push Button Trimphone introduced to celebrate HM the Queen's Silver Jubilee. This was not the only Silver Jubilee phone; the GPO also did a special version of the Compact Telephone 776. The Deltaphone was part of the GPO/BT's special range. They were more individual style phones. Subscribers had to pay significantly more to rent the special range, which included some antique style phones, some modern style designer phones and a Mickey Mouse phone. The Deltaphone, which was STC's original name for the Trimphone, was a white Trimphone clad in leather. 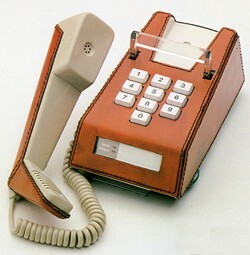 The Deltaphone only came in brown leather. The Deltaphone De-Luxe was a keypad version. You could get the Deltaphone De-Luxe in red or green leather. The Phoenixphone was available as a dial Trimphone (8722) or a push-button one (8766) in a range of new colours: two-tone red, olive green/beige, two-tone orange, black/grey, light green/mid green and cream/brown.